I tried a couple different ways to resolve this. Between the registry and Group Policy's, you are able to stop most all forms of data collecting. The problem comes with finding what issues with programs and OS operations disabling them can cause. Shutting off certain registry and changing certain Group Policy's can stop your search engine from working, block Windows Updates (can be both good and bad), break One Drive functionality, some apps will not download or update, Office 365 issues, among others. A lot of the other features disabled might be more of an issue on laptops or the Surface more than desktops such as different location services and maps update. 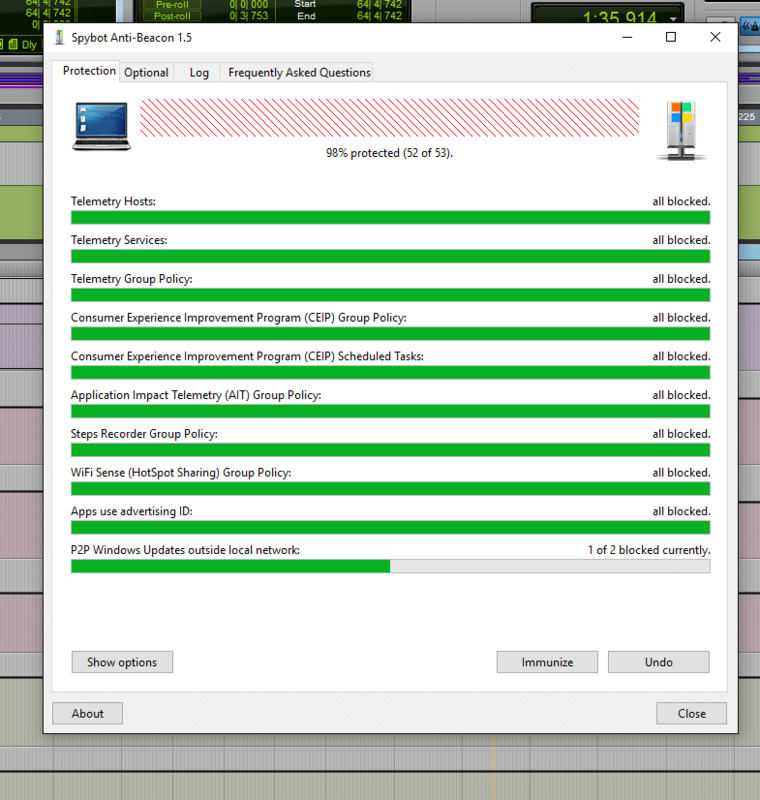 While these can be a mixed bag of good and bad depending on the user, the problem comes in when I want to do a system update for instance or other functions periodically. Jumping in and changing Group Policy objects or registry settings is an option. Many that are comfortable with that could go a step further and write a quick application or batch file to automate it. This is simply not an option for many people though and regardless of which way you go, they are time consuming options. After searching for some applications to automate the process, I stumbled on a couple great options. There were a few parameters to go by in my selection of an application. I wanted an option that would let me know what parameters I am disabling. I also wanted something that I had complete control of what parameters are being disabled/enabled. I also needed something lightweight that would play nicely with Pro Tools and my other normal operating software. 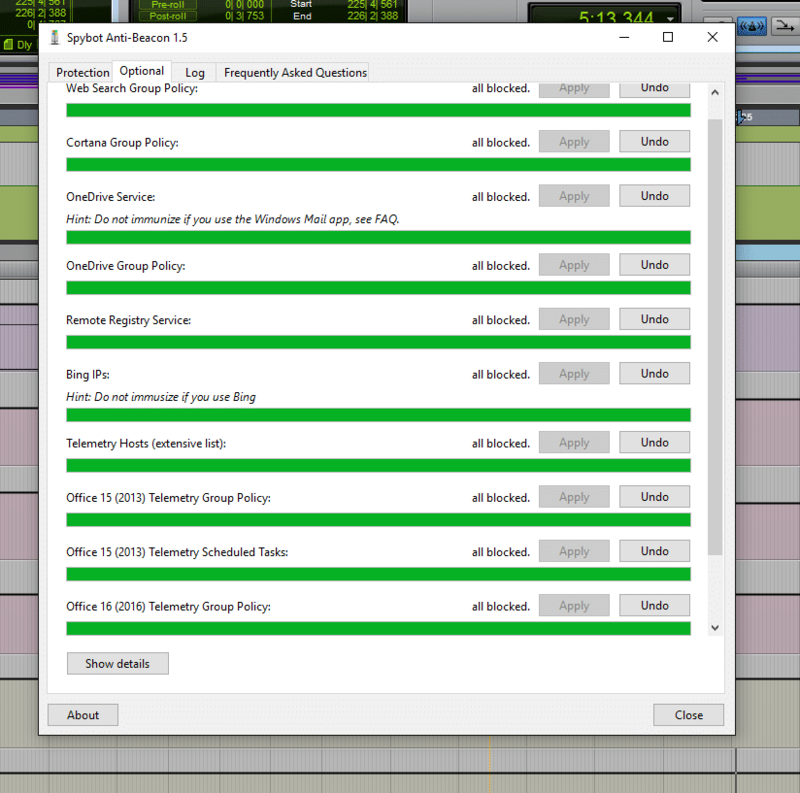 Eventually this was narrowed down to 2 applications to test and run behind Pro Tools. O&O Shutup 10 and SpyBot Anti-Beacon. They both worked quite well. They both have the functions it is blocking in categories. They both give you a selection of the most important options to choose from to disable/enable individually. They both have a "recommended" setting that disables specific parameters of the telemetry. The differences between them were minimal. I will break them out separately. All the parameters are on a single screen. single on/off slider for each paramter. Each parameter broken down into 1 of 3 classes of importance. "Apply All" commands for each of the 3 levels. I do find the Green/Red labeling switch on each parameter a bit confusing at first glance. 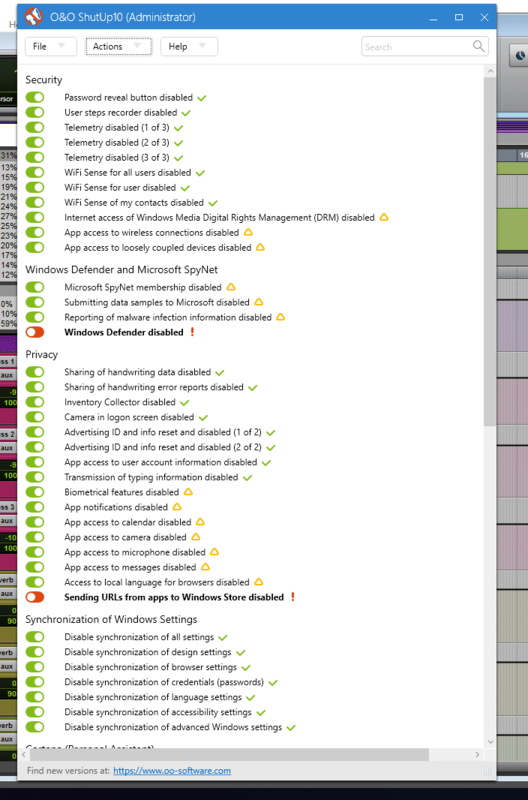 Red means its set by Windows, Green means its turned off by they application. 1 page for recommended basic settings that turns them all off or on or optional switch to set them individually. 2nd page for optional parameters that turn on and off individually. switch to show you the actual Group Policy/Registry settings. Clear labeling as to whether it is blocking or not. It is not as clean of a UI and required to switch pages to get to different parameters. On the optional page, no "all" setting. required to set them individually. Most importantly was how heavy their footprint is on my system and if it causes problems with Pro Tools. Both of them had virtually no system footprint on the ram or CPU usage. I have been running them both on and off for over a month with Pro Tools with absolutely no noticeable problems. They both have perks over the other. They also both have settings in categories that is not present on the other one application. Saying that, all the same parameters could be present in both, Just how they are categorized and laid out could be different. It would be rather difficult to compare the setting changes in the operating system. The layout of O&O is definitely cleaner and easier to navigate. It is also easier to switch large groups of parameters on and off. Both applications offer portable installers and Spybot also offers an installer. I created a setting in the task scheduler to start O&O with the system. Spybot has an installer to simplify that. All in all, I really don't have a preference over the other. They both seemed to do what I set out to do. I say try them both and see which you prefer! 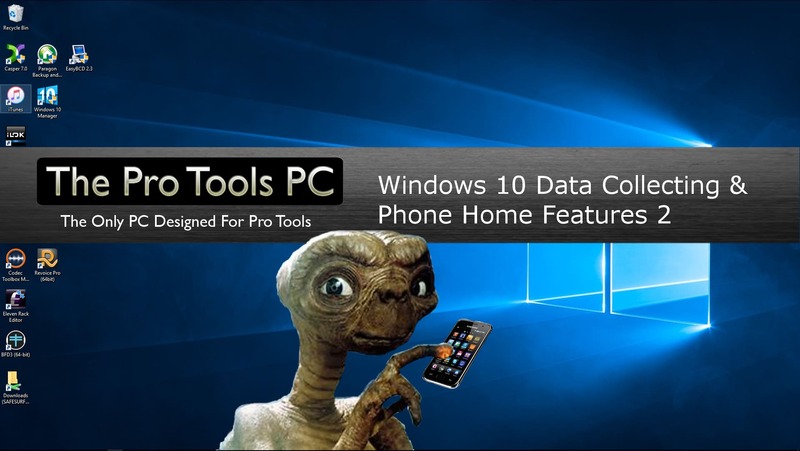 Posted in Discussion, Education, Free Support, System Maintenance, Tech Support, Technical Article, Tutorials and tagged data collecting, data collection, phone home, Pro Tools, support, Telemetry, Windows.